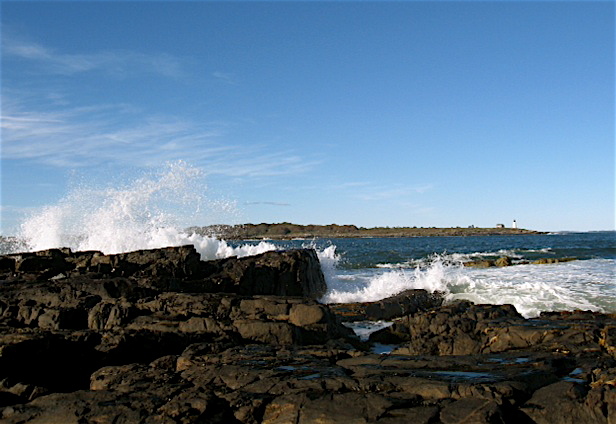 To experience the Maine Coast you have to get out of your car. That’s why Judy and I went to Wells Beach right after dinner. There we walked the shoreline, inhaling the fecund ocean air. Waves licked the beach. A band of pink light accented the horizon before us as the sun set somewhere else. The next day we visited Wells Reserve. Starting at Laudholm Farm, we ambled along a wide path cutting through a field as blue jays and a host of other songbirds serenaded us. Then we followed a boardwalk winding through birches, oaks, maples and white pines until we reached an estuary and the lazy, winding river feeding it. We sat a long while at the edge of two different worlds, right where the forest meets the sea. Towards evening we walked the Marginal Way in Ogunquit – a mile long, paved footpath along the rocky coast, which is magnificent if you can ignore the crowd of tourists doing the same. I had a hard time with that but Judy remained focused on the waves crashing against rocks just below us. She loves both the sight and the sound of it. The following day a storm brewed up. We stayed inland for the most part, but after dark Judy wanted to go back down to Wells Beach. The wind blew with enough force to intimidate me as I imagined ships wrecking on the rocks just off shore. Judy was exhilarated by it, drinking in the raw oceanic power as if it was some kind of elixir. I prefer forest wildness. Judy likes it maritime. We gave ourselves the grand tour the last day, driving up the coast from Wells to Biddeford Pool, stopping by Cape Porpoise for fresh seafood, then walking Goose Rocks Beach barefoot at high tide. We shared the beach with a few locals and hungry shorebirds, leaving footprints in the sand that quickly washed away. We finished our tour at East Point Sanctuary, where the waves slammed against the rocky shore in great foamy explosions. Funny how long one can sit and watch them, how mesmerizing they can be. Then we left the sanctuary feeling strangely calm, as if all our routine worries had been worn down by churning water. The Maine coast is good for that. Not much stands firm against the power of the sea.